Judge(s): CJ Furlong, Mount Joy, Pa. 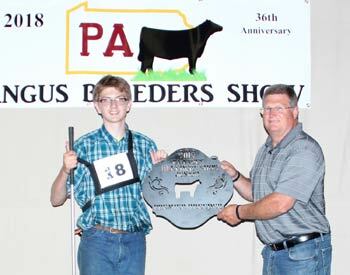 Chance Rains, Mercer, Pa., left, won premier junior breeder at the 2018 Pennsylvania Breeder's Junior Angus Show, June 21-22 in Huntingdon, Pa. Pictured presenting the award is Sam Long, show committee member, right. Photo by Chris Jeffcoat, American Angus Association. 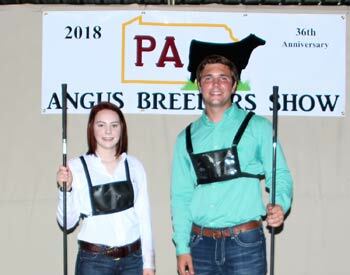 These junior Angus members won top honors in the senior showmanship divsion at the 2018 Pennsylvania Breeder's Junior Angus Show, June 21-22 in Huntingdon, Pa. Pictured from left are Jade Zimmerman, Drumore, champion; and Grant Cash, York, reserve champion. Photo by Chris Jeffcoat, American Angus Association. 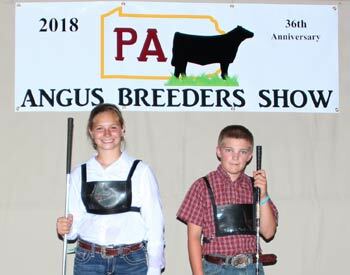 These junior Angus members won top honors in the intermediate showmanship division at the 2018 Pennsylvania Breeder's Junior Angus Show, June 21-22 in Huntingdon, Pa. Pictured from left are Kiersten Baker, James Creek, champion; and Kaitlin Bell, Nottingham, reserve champion. Photo by Chris Jeffcoat, American Angus Association. 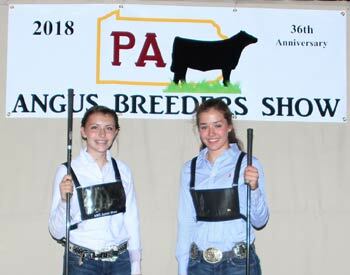 These Angus enthusiasts won top honors in the junior showmanship division at the 2018 Pennsylvania Breeder's Junior Angus Show, June 21-22 in Huntingdon, Pa. Pictured from left are Raven Eisenhour, Wellsville, champion; and Payton Engle, Cochranville, reserve champion. Photo by Chris Jeffcoat, American Angus Association. 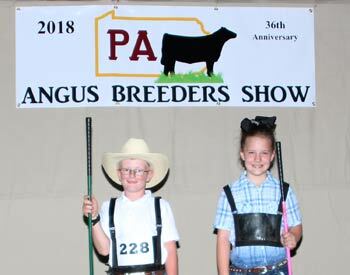 These young Angus enthusiasts won top honors in the novice showmanship division at the 2018 Pennsylvania Breeder's Junior Angus Show, June 21-22 in Huntingdon, Pa. Pictured from left are Kolton Grim, Thomasville, champion; and Gabrielle Jacobs, Airville, reserve champion. Photo by Chris Jeffcoat, American Angus Association. 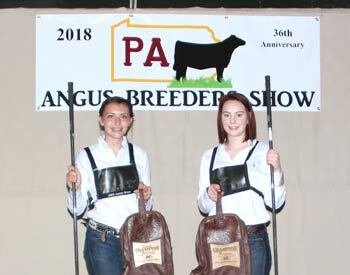 Jade Zimmerman, Drumore, grand champion, right; and Kiersten Baker, James Creek, reserve champion, left, were the overall showmanship winners at the 2018 Pennsylvania Breeder's Junior Angus Show, June 21-22 in Huntingdon, Pa. Photo by Chris Jeffcoat, American Angus Association.